All sorts of surprising facts about animals, history, science and much more. Fun facts and quizzes about how your body works. Hop in a time machine and travel through 5000 years of art! Find a space "Fact of the Day" and lots more about Earth, our Solar System, space exploration, asteroids, comets, stars, the universe and much more. An information book with a difference, with over 135 flaps to lift to uncover the fascinating facts beneath. Find out what karaoke means in Japanese, how the Mona Lisa got her name and how many people alive today are descendants of Genghis Khan. Divided into subjects such as Living Things, Science Lab, Treasure Trove, When Did It Happen? and more, and each double page is packed full of facts. Covers a wide range of topics including the periodic table, the formation of the Earth, the TV programme Blue Peter, saltwater crocodiles, the great pyramid of Giza and lots more. 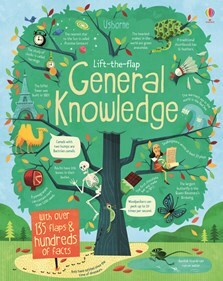 Ideal for improving general knowledge and guaranteed to keep any fact-loving, question-asking child entertained for hours. Wonderful illustrations and graphics together with small text boxes and bubbles reveal the fascinating facts. There's even a 'True or False' spread and a 'Can you match' quiz for all the family to play. All in all a fountain of fascinating facts. This rather lovely introduction to the world of facts and the fun behind them is delivered in the publisher’s indubitable effervescent house style.